The Alonissos Museum of Kostas and Angela Mavrikis would like to invite all area artists to participate in our Second Annual Art Market on Thursday July 25th and Friday July 26th, which is held in the Alonissos Museum in Patitiri. This well attended event is held every year and has a reputation for offering high quality art and fine crafts. For all information on how to participate in this market, please visit our website at alonissosmuseum.com, or call the Art Center at (242400) 66250. Don’t miss out! Deadline for applications is Wednesday 24th of July! A new photo book by Kostas Mavrikis was presented on Saturday, March 10 in the auditorium of the Town. The event was attended by Mayor Petros Vafinis, all the councilors and many Alonnisiotes. Within the pages of this book entitled "Yesterday" which was written in collaboration with Wil Oosterveld, you are invited to enjoy and appreciate a selection of 700 old photographs of life on Alonissos and its outer islands. The proceeds from the sale of the book will go towards creating KAPI of Alonissos (Alonissos Pensionate Inhabitants Centre."). Underneath an impression of the night of the presentation in the theatre of the Town Hall. There have been a couple of changes made in the museum over the winter to improve existing exhibits, enlarge the product range of the museum shop, fitting light in each separate vitrine of the war-department, re-connect the airco in the conference room and to give the large terrace of the cafe a more "pirate-like" face. In May a school of Skiathos visited the museum and especcially the large wall painting on the large terrace thrilled the kids. Underneath we show the change from design to reality. Due to the fact that Greek Government has absolutely no funds available anymore to support museum life in Greece, a number of fund raising activities have been launched to improve the quality of the Alonissos Museum. The sale of Kostas Mavrikis' new book "These Scattered Isles" was already a little bit of a success over the winter time with more than 40 issues sold in the webshop. We trust that this book will generate even more funds in the season to come, which is necessary because the number of tourists visiting the island and the museum have dropped in comparison to the last two years. The museum shop sells this year original paintings from two Greek painters, namely Maria Vlaikos and Stamatoula Kaloyiannis. Especially the work of Stamatoula needs to be mentioned because she paints all her subjects in original Iconographic style. The paint she uses is made by herself of herbs and plants from the island. Furthermore some small sculptures of John Simpson are for sale in the museum shop. Of course all paintings and sculptures are unique. The Association of Friends of the Alonissos' Museum (FOAM) started a campaign to re-activate existing members and acquire new ones. Although the direct results of the mail shot were not overwhelming, some new members were acquired. During the tourist season of 2011 more attention will be given to the fact that people who appreciate the Alonissos Museum, can support it by becoming a FOAM-member for a small anual amount. In this way the membership fees can play an important role in helping to support and sponsor museum programs and activities. This is a picture of a promotion booth of FOAM, situated in the entrance hall of the museum. This year there is a variety of exhibitions and performances. It differs from a large photo exhibition in June of the Lithuanian photographer Kristina Jasudaitė. In July and August two so-called "Triple-P" evenings with Piano-Poetry & Paintings are planned. On these evenings David Lane will give a piano recital, while Maro Vouduroglou-Vlachaki reads out of her poetry books. In the museum are paintings of Ingrid Pintgen to illustrate everything. On the 17th of July starts an exhibition of paintings from Takis Dimopoulos and last but absolutely not least in August we present jewellery, paintings and small sculptures of the internationally famous Italian artist, Auro. The Auro-exhibition will start with a large audio-visual show both inside and outside of the museum. This will be a huge spectacle using the harbour and surrounding hills as a ‘projection screen’ for his art. 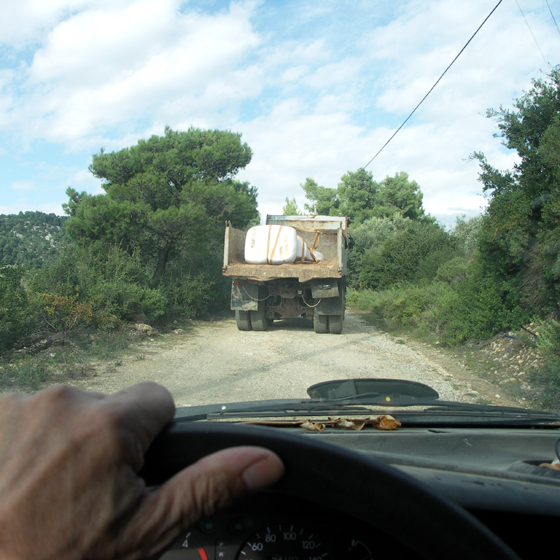 As you probably know Greece is in the midst of a severe economic crisis. This means that, amongst other things, there is absolutely no money available from the government to support cultural and historical institutions, and certainly not for a privately owned museum like the Alonissos (Pirate) Museum. But this is no tragedy; we see it as a challenge to find new ways to raise funds to maintain or even improve the quality of our museum. One of the ways to generate extra income is the webshop that we recently created; another way is to revitalize the "Friends of Alonissos' Museum Association". Almost since the start, the museum has been supported by a small group of "Friends of Alonissos' Museum". There was no admission fee to the museum because the management of the museum used the list of members to convince the authorities of the cultural importance of the museum. Now things have dramatically changed. Enlarging the organization with more international Friends is one of the priorities of the museum. Any individual or a legal entity may become a museum friend. At the same time we have to combine every new membership with an anual membership fee. In this way your membership can play an important role in helping to support and sponsor museum programs and activities. A 15% discount at the museum's shop on articles over 10 euro on showing your FOAM-pass. How can you become a Friend of Alonissos' Museum? You can apply for membership by mailing us at admin@alonissosmuseum.com or download the Application (PDF file) by clicking here and post it to us. The address of the friends can be found in the FOAM-menu. Payments can be made via PayPal in the FOAM menu on top or by transferring money into the FOAM-bankaccount. What are the costs of being a Friend of the Alonissos' Museum? 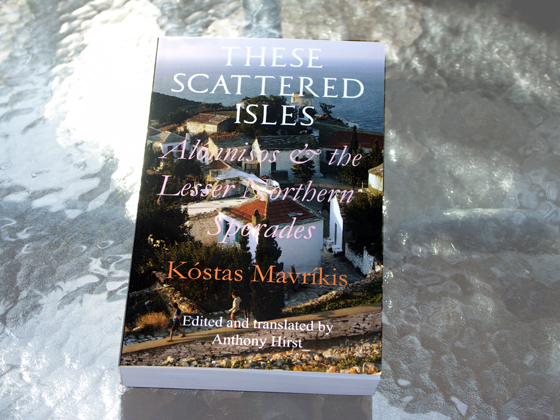 Since November last year the Alonissos Museum stocks copies of the newly published book “These Scattered Isles” which is the first English translation of the book by Kostas Mavrikis. The book explores legends, historical evidence and written texts to provide a multi-faceted image of Alonissos and the Lesser Northern Sporades. Originally published in Greek, These Scattered Isles is the product of Kostas Mavrikis' passionate curiosity to explore the islands and all that they represent, while hearing the fruits of his extraordinarily detailed research. Now translated into English by Anthony Hirst, with additional research by both Mavrikis and Hirst and a wealth of new illustrations, this almost 500 pages counting book cannot fail to delight and enchant you. There are two versions of the book available: one with colour pictures and thicker paper and a black-and-white version. The contents of both versions is exactly the same but the book with the colour photos is heavier and the quality of the prints inside is better. Editorial and ordering details of this book, inclusive costs for packing and postage, can be found in the chapter "web shop" under "books". There you can pay with PayPal. Since a couple of years a huge sculpture of John Simpson was standing in front of a house in Isomata, close to Steni Vala. This house was sold recently and the new owner did not want the sculpture anymore on his premises. He threatened to destroy it if the sculpture had not been removed before the end of the year. So, the sculptor came over to save it and with the help of relations of Kostas Mavrikes and staff members of the museum, the sculpture was moved safely to its new home, in front of the museum, overlooking the harbour of Patitiri. Underneath you'll find an impression of casting the concrete floor outside the museum and the transport of this 5 tons sculpture. 22nd of November 2010 casting the concrete floor and 25th of November 2010 transporting a 5 tons sculpture from a house in Isomata to the museum in Patitiri.